Remember French Cooking Fridays? It was my journey cooking through A Kitchen In France by Mimi Thorisson - my first true experience working with French recipes. While it had its frustrations, it also had its accomplishments. It was rewarding making it through some of those harder recipes and eye opening to whiz through the easier ones. For example, there was a chicken recipe that took hardly any time at all and was one of the best chicken recipes I’d ever made in my life. Who knew French food could be so easy? I’ll tell you, no one who is familiar with stereotypical French cuisine. As I continue reading Julie & Julia, I’m seeing that the majority of the recipes included, or at least the ones she writes about, are expert level recipes. Is that the truth about any cuisine though? Regardless of the country, everyone needs easy weeknight recipes every once in a while. I mean, what about a croque madame or croque monsieur? That’s hardly a major time commitment. A Kitchen In France did more than expand my cooking skills, it expanded my mind when it came to French Food. Not only does it have the traditional laborious dishes that are decadent and rich, it also has dishes that are light, simple and come together in no time. That was one of the reasons I loved sharing my experiences cooking through A Kitchen In France. I wanted to open the definition of French cuisine and show that it’s not all 8 hour cooking sessions and heavy meals. It’s versatile and seasonal like any other cuisine. When I found out Mimi had come out with a second cookbook, I knew that I needed it for my cookbook shelf (now shelves). French Country Cooking is organized a little different than A Kitchen In France. While AKIF was organized by season, FCC is organized by course: sides, starters, main courses, staff meals, Sunday suppers, desserts, gouter (snacks), and drinks. Mimi was inspired by the pop-up restaurant her and her husband had taken over in the Medoc region of France. Main courses are dishes you’d see in the restaurant. Staff meals are less complicated, quicker options to feed workers on breaks. Sunday supper dishes are meals you’d cook for your family, something very important to Mimi and her family. The others explain themselves except gouter. A little background info...the French do not eat between meals. They hardly even drink. Because dinner is so late (no earlier than 7:30pm and as late as 10pm), to keep hunger at bay they’ll have a little gouter in the late afternoon to tide them over until dinnertime. A gouter is sweet or savory, sometimes a little of both! The meal I chose to showcase French food for our “Around the World” series is classically French. From onion soup to pears with chocolate, these dishes showcase the finesse of French cuisine, the decadence of French cuisine, and the simplicity. Each dish has a different level of work involved and each dish has a different number of ingredients required. I was hoping to show the versatility of the culture. You tell me if I did it justice. French Onion Soup is one of those dishes that are without question French. Mimi’s recipe, by coincidence, mimics the same recipe the woman who owned the restaurant before her used to serve. Her name was Plantia so Mimi named the recipe after her. The secret to both of their soups is duck fat and using comte or gruyere cheese on the toasts. I did not use duck fat but I did use gruyere cheese! Onion Soup is super simple to make. Onions cook down until soft before chicken stock, wine and a few other ingredients get thrown in the pot. Everything simmers for a bit before placing cheese toasts on top for a delightful bowl of soup. This recipe may lack ingredients but it lacks no flavor. It’s a recipes that feeds the soul. I recently read the part in Julie & Julia where Julie makes Pot au Feu for a group of friends. Pot au Feu and Poule au Pot are similar in that they’re both boiled dishes. Pot au Feu is several types of meat all boiled in a large pot with veggies. Poule au Pot is a stuffed whole chicken boiled in a pot with vegetables. Similar, right? Another thing they have in common is that they are not visually satisfactory. They’re actually kind of gross. I wanted to share a photo of the Poule au Pot once it finished cooking to show the stuffing and all that but it was gag worthy. I was not putting a photo of that on the blog. 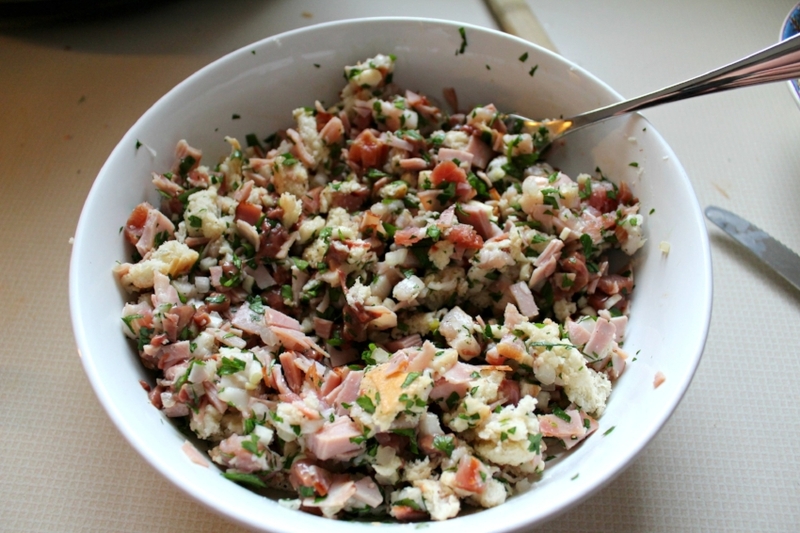 Poule au Pot is one of those traditional go-to French dishes made for comfort. It’s also one of those dishes that can be made a million different ways. The prep is a little intense for this one with the stuffing but other than that, it’s not too bad. A creamy mushroom sauce finishes the dish using some of the homemade stock from the pot. That’s the biggest pro for this recipe. The water that the chicken and veggies boil in transitions into a beautiful, rich stock that you can use later in the week. I had about 3-4 quarts of stock leftover that I used all week long. 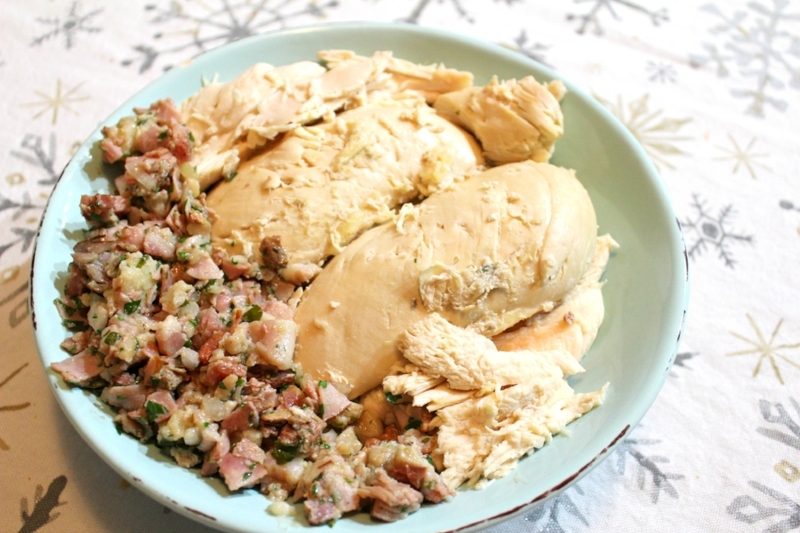 So while Poule au Pot may not be visually stunning and translated to English (boiled chicken) might not sound scrumptious, it’s actually a very tasty dish and it’s also comforting. Whip it up on the weekends when you have a little extra time on your hands. What comes to mind when you think of French desserts? Macarons? Souffle? Chocolate Mousse? How about a baked fruit drizzled in dark chocolate? Because that’s exactly what this is. Four (five if you use mint) ingredients come together for an indulgent dessert that tastes more sinful than it actually is. Melted butter drizzles over halved pears followed by a hint of honey. They’re baked until tender before finished with a healthy drizzle of melted dark chocolate. It’s a dish where the fruit shines but does not taste one bit healthy. The best part is that you don’t feel guilty or gross after indulging. You feel satisfied, satiated and ready for a glass of bubbles. Might we suggest strawberries in prosecco?? We have a one recipe and one cookbook feature to go! In case you missed the others, see our stops around the world cooking in Italy, Thailand, Greece, North Africa and Mexico. French Cooking Friday: Pumpkin Soup, Flavor-Packed Potatoes, A Galette & More! French Cooking: Soupe au Pisto, Coucous, Cream Puffs & More!